Christine Elizabeth "Tina" Flint Smith (born March 4, 1958) is an American politician and former businesswoman serving as the junior United States senator from Minnesota since 2018, filling the seat vacated by Al Franken. She is a member of the Minnesota Democratic–Farmer–Labor Party ( DFL), an affiliate of the Democratic Party. Smith served as the 48th lieutenant governor of Minnesota from 2015 to 2018, when she was appointed to serve as a U.S. Senator for the state. She won the 2018 special election, defeating the Republican nominee, Minnesota State Senator Karin Housley. In 2016 Roll Call named Smith to their "America's Top 25 Most Influential Women in State Politics" list, citing her high-profile role in the Dayton administration. ^ Flint, Edward Frances; Flint, Gwendolyn Slaughter (December 16, 1984). Flint family history of the adventuresome seven. Gateway Press. Retrieved December 16, 2018 – via Google Books. ^ a b "About Tina | Senator Tina Smith". www.smith.senate.gov. Retrieved 2018-07-10. ^ Terrell, Steve. "Senator who stepped into Minnesota role has deep New Mexico roots". Santa Fe New Mexican. Retrieved December 16, 2018. ^ "Tina Smith: Minnesota's Next Lieutenant Governor". Mark Dayton for a Better Minnesota. Archived from the original on July 2, 2014. Retrieved November 5, 2014. ^ a b Condon, Patrick (October 10, 2016). "Lt. Gov. Tina Smith's high-profile role fuels speculation about her political future". Star Tribune. Retrieved August 12, 2016. 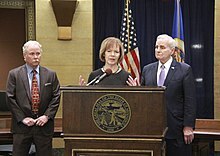 ^ "Governor Mark Dayton Appoints Lieutenant Governor Tina Smith to Serve as United States Senator". Office of Governor Mark Dayton and Lt. Governor Tina Smith. Retrieved December 30, 2017. ^ a b Bierschbach, Briana. 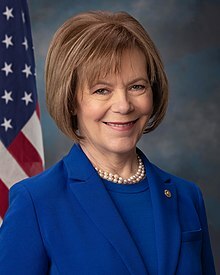 "Minnesota, meet your next U.S. senator: Tina Smith". MinnPost. Retrieved December 30, 2017. ^ a b Potter, Kyle. "Minnesota Lt. Gov. Tina Smith named to fill Franken seat". Star Tribune. Retrieved December 30, 2017. ^ Bierschbach, Briana (February 4, 2014). "Veteran behind-the-scenes player Tina Smith steps forward as Dayton's running mate". MinnPost. Retrieved November 5, 2014. ^ Pugmire, Tim. "As Dayton weighs Franken replacement, who may run in 2018?". Minnesota Public Radio. Retrieved December 8, 2017. ^ Bierschbach, Briana (February 2, 2015). "The rise of Tina Smith". MinnPost. Retrieved August 12, 2016. ^ Bierschbach, Briana (February 2, 2015). "The rise of Tina Smith". Minneapolis: MinnPost. ^ Simons, Abby. "Franken cruises to easy re-election". Star Tribune. Retrieved December 29, 2017. ^ "Smith resigns as Lt. Governor, prepares for start in the Senate". KMSP Fox 9. Retrieved January 3, 2018. ^ Grow, Doug (May 9, 2016). "Why there has never been a lieutenant governor like Tina Smith". MinnPost. Retrieved August 12, 2016. ^ Condon, Patrick (October 10, 2016). "Lt. Gov. Tina Smith's high-profile role fuels speculation about her political future". Star Tribune. Retrieved August 12, 2016. ^ "Tina Smith resigns from Mayo Clinic board as her move to Senate nears". Twin Cities. December 28, 2017. Retrieved December 29, 2017. ^ Wilkins, Emily (March 18, 2016). "From Top Lieutenant to Lt. Governor". MinnPost. Retrieved August 12, 2016. ^ Rao, Maya. "Transition time: Franken moves out, Smith moves in". Star Tribune. Retrieved January 2, 2018. ^ "'I shouldn't be underestimated': Tina Smith will take Al Franken's seat — and run again in 2018". Twin Cities. December 13, 2017. Retrieved December 18, 2017. ^ "Minnesota Democrats aim to clear Tina Smith's path for 2018 Senate bid". Twin Cities. December 14, 2017. Retrieved December 18, 2017. ^ Samuels, Brett (January 2, 2018). "Franken makes Senate resignation official". TheHill. Retrieved January 3, 2018. ^ "United States Senate Appointment and Lieutenant Governor Transition". Office of Governor Mark Dayton and Lt. Governor Tina Smith. Retrieved January 3, 2018. ^ "Minnesota Lt. Gov. Tina Smith sworn in as senator, replacing Franken". ABC News. January 3, 2018. Retrieved January 3, 2018. ^ "Schumer Announces Updated Senate Democratic Committee Memberships for the 115th Congress, 2nd Session | Senate Democratic Leadership". www.democrats.senate.gov. Retrieved January 10, 2018. ^ "United States Senate special election in Minnesota (August 14, 2018 Democratic primary)". Ballotpedia. Retrieved 25 June 2018. ^ FOX. "Minnesota primary election results roundup". KMSP. Retrieved 2018-08-30. ^ "Tina Smith, Karin Housley make for historic matchup for U.S. Senate". Star Tribune. Retrieved 2018-08-30. ^ "Minnesota U.S. Senate Special Election Results". The New York Times. 2018-11-14. Retrieved 2018-11-14. ^ Fandos, Nicholas (December 18, 2018). "Senate Passes Bipartisan Criminal Justice Bill". New York Times. In one of this Congress’s final acts, every Democrat and all but 12 Republicans voted in favor of the legislation — an outcome that looked highly unlikely this month amid skepticism from Republican leaders. ^ Minato, Charlie (December 7, 2018). "21 SENATORS SEND LETTER URGING FDA TO BAN FLAVORED TOBACCO, MENTHOL". halfwheel.com. ^ "Health care Q+A with Senate candidates Smith, Housley". Retrieved 2018-10-26. ^ Weixel, Nathaniel (August 15, 2018). "Senate Dems demand immediate reunification of remaining separated children". The Hill. ^ "Tina Smith on Immigration". www.ontheissues.org. Retrieved 2019-03-20.